Step #1: Remove and neutralize chloride ions attached to your equipment. Chloride-ions makeup one of the largest costs in maintenance of metal surfaces and the most costly deterioration mechanism facing state highway agencies in the US. According to a study done at Rensselaer Polytechnic Institute, the price of Highway Salt is only 3.5% of the overall maintenance cost. CLION-X™ is a neutralizing wash designed to effectively remove chloride salt residue from salt spreaders, plows, truck bodies and frames. Chloride salt residue forms a strong and corrosive bond with painted and unpainted metals. It is extremely important to remove all traces of chloride salt residue from equipment to prevent rust, integrity failure and to prolong the life of your investment. Use CLION-X™ to remove the chloride-ion. Extending the life-cycle of your equipment is the single most valuable maintenance action you take. Include CLION-X™ in your truck wash program, and your bridge deck maintenance program. 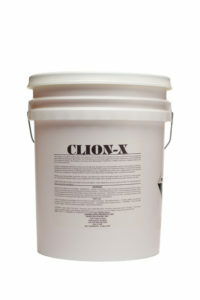 CLION-X™ is available in 15, 30, 55 and 270 gallon poly drums and containers. Shipping is available via LTL and UPS. Step #2: Stop rust and corrosion from consuming the integrity of your asset. Rust is slowly annihilating your equipment, and must be removed or it will continue to eat away at the metal. Paint will not stop rust. ARREST™ is a concentrated blend of inorganic acids, wetting agents, detergents and water softeners; specifically designed for the rapid removal of rust. ARREST™ adds a phosphatized surface on ferrous metals for protection against further rusting. The detergent action in ARREST™ helps to remove grease and oils accumulated on the metal surface. Phosphatizing creates a conductive surface for metals to be painted following rust removal. ARREST™ softens and dissolves rust from salt spreading equipment, machinery, sheet iron, bridges, pipes, concrete, metal parts, automobiles, truck bodies, mower blades, ferrous metal surfaces, and weld points on stainless steel spreaders. 1. Remove rust. Apply liberally to rusted areas, by soaking, brushing or spraying. Treatment time will vary depending upon the extent of rust. Usually the process may be completed within 30 minutes. Solution may remain on surface for longer periods if required. A second application may be necessary for extensive rust.Pressure wash or rinse well. 2. Dilute 8 to 1 and apply to cleaned area, spraying, brushing or soaking; as a phosphatizing rust preventative. Air dry. Do not rinse. 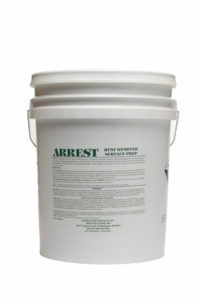 ARREST™ is available in 15, 30, 55 and 270 gallon poly drums and containers. Shipping is available via LTL and UPS. Step #3: Apply a protective barrier to your asset to shield against chloride contamination and rust. MOLYCOR PLUS™ is formulated with a processed bituminous base and fortified with additives that help prevent wear, oxidation and corrosion. Oil soluble MOLYCOR PLUS™ contains drying agents and solvents that allow greater penetration into virtually all wire ropes, cables and chains. 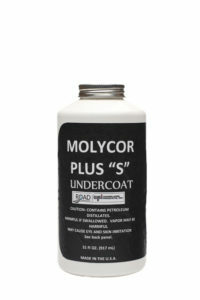 MOLYCOR PLUS™ is ideal for coating the inside of spreader boxes. MOLYCOR PLUS is one of the only protective barriers that may be used on stainless steel spreaders. MOLYCOR PLUS™ is especially formulated for use on wire ropes, cables, chains and salt/sand spreaders. The unique formula of MOLYCOR PLUS adheres better than any other protective lubricant available today. MOLYCOR PLUS™ is also recommended for lubrication and protection of truck bodies, lube points and friction points. For spreader boxes, MOLYCOR PLUS™ is recommended as a protective barrier prior, during and after winter maintenance season. MOLYCOR PLUS™ may be applied by brush, spray, pour, drip oilers or pressure applicator. No heating or dilution is required. No surface preparation is required, however pre-treating with CLION-X™ and ARREST™ is recommended. Allow 20-30 minutes for maximum protection and drying. Repeat as needed. MOLYCOR PLUS™ is available in 15, 30, 55 and 270 gallon poly drums and containers. Shipping is available via LTL and UPS.